Feral pigeons are a common sight, particularly in urban areas where they can constitute a nuisance and cause real damage to buildings and other structures.The long-term control of these birds is notoriously difficult to achieve, even with professional assistance from a member of the British Pest Control Association (BCPA). What’s more, many building professionals and management companies take a narrow view when it comes to pest control. 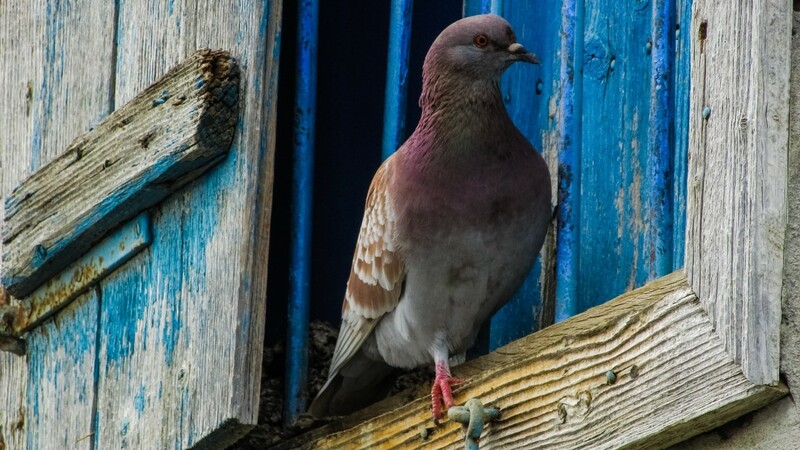 The most successful way to control feral pigeons is to pursue a holistic approach, with expert independent advice, building investigation and specialist consultancy provided by renowned building professionals such as Hutton & Rostron. What do we know about feral pigeons? Feral pigeons (Columba liviadomestica) are descended from wild rock doves that thrive in a cliff environment, originally on the western coast of Europe and around the Mediterranean. Having interbred with many different strains, the birds are now well adapted to live in modern city environments where tall buildings provide habitats that are very similar to their natural surroundings. Large flocks will happily roost in empty loft spaces, on ledges and under bridges – in fact in most urban spaces that offer a small amount of shelter. The natural diet of feral pigeons consists of grains and seeds, but they easily adapt their diet to include processed vegetable and animal products and will scavenge food, help themselves to household scraps, discarded takeaway foods. With an adequate food supply, feral pigeons breed throughout the year, producing 3-6 broods of 2 ‘squabs’ per year. Individual pigeons can live as long as 30 years. As wild birds, pigeons are capable of finding their own food – they do not require feeding. In fact, feeding pigeons attracts them to areas that are not natural to them and causes overcrowding, disease and injury to the birds. What problems do feral pigeons cause? Far from being harmless animals, feral pigeons have the potential to cause real damage to buildings as well as human health. Displacing roof coverings to force entry can lead to water ingress into the building. Nesting in gutters and hopper heads will cause a complete blockage and disrupt drainage. Faeces, feathers and other detritus can block drainage, gutters and air vents. Pigeon droppings are acidic and can damage brickwork and render. In unoccupied buildings, the resultant water penetration may not be detected immediately, leading to seriousstructural damage, damp and decay. Feral pigeons, and particularly their faeces, carry a range of diseases that can be a potentialhealth hazard to humans which include salmonellosis, psittacosis, pseudo-tuberculosis, histoplasmosis, aspergillosis, cryptococcis and listeriosis. 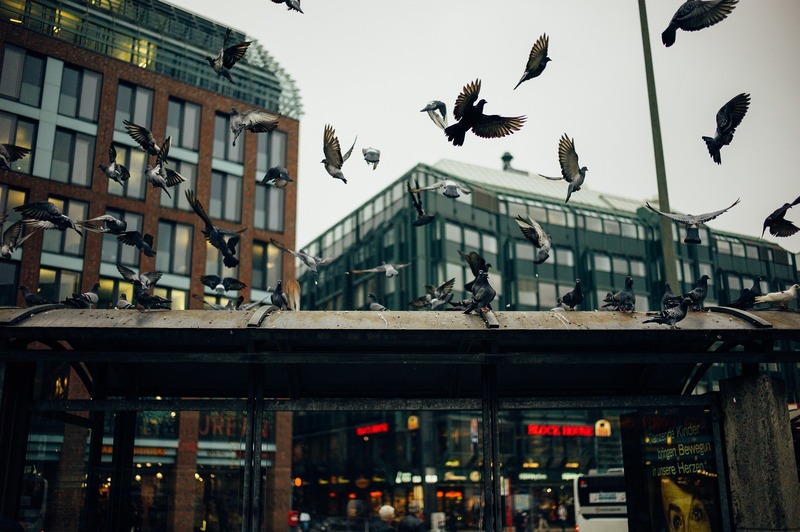 Pigeons carry mites that can cause skin disease in humans, and they can spread fleas and other parasites into inhabited buildings. Dust from pigeon feathers can cause respiratory problems in humans. Surfaces can become slippery as a result of pigeon droppings, or food left out for pigeons. This can be a problem for walkways and pavements affecting the general public; it can also cause hazardous conditions for building maintenance operatives higher up on building ledges etc. A flock of pigeons suddenly taking flight can cause hazards to pedestrians and motorists. Pigeon faeces and detritus is visually unattractive, as well as difficult and expensive to remove. Bird noise and nesting activity, particularly in the early hours, and the birds’ continuous begging for food is highly irritating. How do you control feral pigeons? Food is the single most important factor that determines the size of a pigeon population. The most successful long-term solution to pigeon problems is to reduce the availability of food. Bird scarers – visual, audio or mechanical – may work for a short period until the bird population has adapted to the impulses given. Bird nets are typically large mesh plastic nets fixed to an area of the building to prevent access – a cheap and effective proofing technique. Sprung wires – placed along narrow ledges to interfere with the birds landing and taking off – are a tried and tested solution with a lifespan of up to 10 year. Spikes – plastic or stainless steel – are fixed to the building to prevent pigeons from landing. However, they are relatively expensive and unattractive, and may be dangerous. 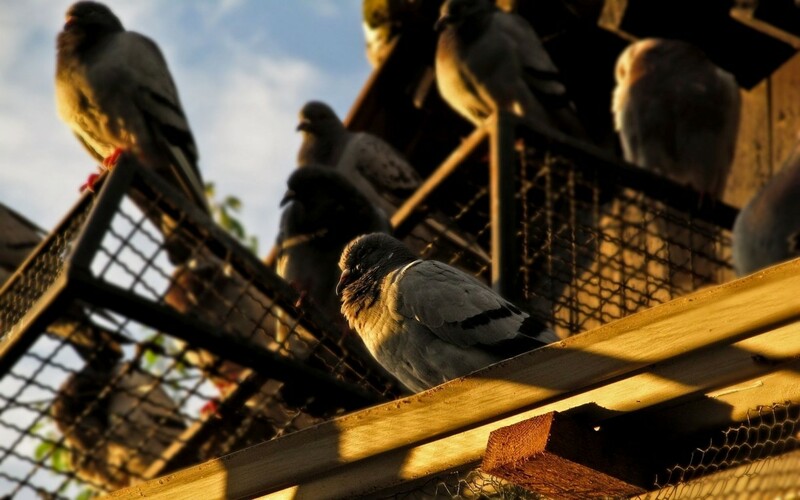 Gel repellants – an adhesive gel applied to the surface making it unpleasant for pigeons to perch. An effective deterrent in the short term, gels can lose their adhesion over time, may be messy and difficult to remove. Pigeon control through measures to reduce the pigeon population is general seen as less desirable and less effective. They include the removal of nest sites, using bait impregnated with birth control agents, introducing airborne predators such as falcons or domestic carnivores such as mink or ferrets, narcotic bait to stupefy and then remove birds, live trapping, and shooting. Feral pigeons are protected under the Wildlife and Countryside Act 1981, with control permitted by authorised persons using specified methods. It should be pointed out that the use of spring traps, poisons, gassing, as well as the use of some nets and adhesives are illegal.